About Us New | John Vetter & Sons, Inc.
We are a family business in our third generation. We have 3 state licensed Home Inspectors on staff. I guess you can say we have grown up in the business. Cesar Mejia, my son in law, is bi-lingual. Each inspection is taken personally. We have a unique reputation. A well-known high end builder in Vero told one of our clients, “…Vetter is the guy you want to inspect the house if you are buying it and hope he doesn’t do it if you are selling it..”. Our reports are clear and easy to understand and delivered the same night as the inspection. In 1968 Jack Vetter came to Florida and found a little bit of paradise when he arrived in Vero Beach. He bought property on the beach and started to build custom homes. In 1974 he started the business John Vetter & Sons, Inc. along with his wife Elaine and son John. We came from Long Island where the business, Atlantic Roof Truss Company, was founded by Jack in 1955. While on Long Island he built and designed most of the bowling alleys in Suffolk County. He was known for solid, long-lasting structures. In the ’60’s eastern Long Island was famous for their potatoes, but they had a storage problem with the freezing winters. Jack Vetter designed an agricultural storage facility that could be built economically, prevent the potatoes from freezing and keep them stored until early into the next year when the farmers could sell them at a higher price. Jack was most famous for building the Church in Rocky Point that resembled a fish, a whale and a bird. He won the New York City Architectural Building Award. He was growing tired of the snow and cold winters and wanted to move to Florida. In Vero, John Vetter & Sons worked all phases of construction. Having the model on 27th Ave and the famous “purple van”, we had the opportunity to build homes for many customers who became friends. We remodeled the Blue Dolphin Motel into a retail/office operation that houses Chelsea’s today. Our flagship building was for Bernie Grall and his office, Tara Plantation, on Route 60. In 1995 John Vetter took the business in a new direction, that of insurance restoration, and changed the name to Vetter Construction of Vero Beach. Restoration is a fast paced business where we helped hundreds of people each year get them back to their normal daily lives and routines. Vetter Construction was sold after Hurricane Frances came to town, but John Vetter & Sons continued in the construction business doing inspections. Being a second generation builder, with over 40 years experience in construction in Vero Beach and having worked all phases of building, gives me a unique perspective when doing inspections. Managing the company and running the jobs in the field has given me the opportunity to see first hand what is behind the walls and how it was constructed. 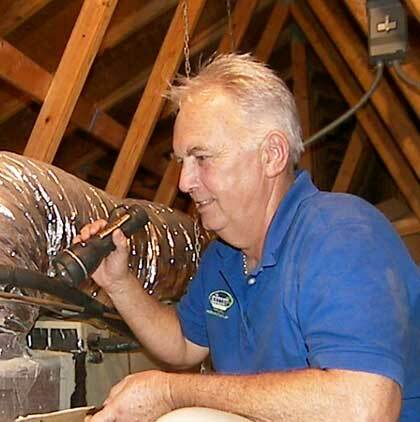 Over the years I have supervised and worked closely with most of the mechanical sub-contractors in Indian River County. Knowing how it is built from the ground up, remodeling it, and restoring it, is a benefit to you when I do your inspections. I am known for fast, accurate and honest service.